The sensor is used in a low frequency oscillator circuit, which changes frequency as the relative humidity changes. The output of the oscillator is fed into the microprocessor. 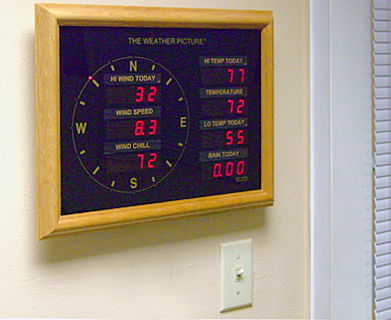 Big, bright, easy-to-read wall display suits any place where people need up-to-the-second local weather data. Offered in Oak or Aluminum frame style. The ULTIMETER 2100 includes BAROMETRIC PRESSURE and numeric pressure change over a 3 hour period (which is the U.S. Weather Service standard interval) plus a preset barometric STORM ALERT, WIND SPEED, WIND DIRECTION (click to see sensor), OUTDOOR TEMPERATURE (click to see sensor), INDOOR TEMPERATURE, WIND CHILL, TIME, DATE, OUTDOOR HUMIDITY (with optional sensor ), DEW POINT, AND HEAT INDEX; INDOOR HUMIDITY (with optional sensor ), and RAINFALL (with optional sensor ). The ULTIMETER 2100 features not one, but two VERSATILE 7-MODE SERIAL PORTS that can accept remote commands, making it easy to communicate with external devices to transmit the data or collect it remotely by phone, modem, or radio link. The 5-minute packet mode is perfect for economical radio "beacon" transmission. 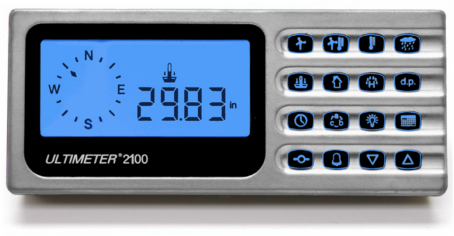 The 2100 comes "APRS-Ready," requiring only direct cable connection to a TNC. A second Serial Data Port connection (new feature) is provided in the ULTIMETER 2100's sensor junction box, delivering greater flexibility in the location and connection of THE WEATHER PICTURE, PC Weather Data Logger, or other peripheral weather accessory. The system has an exclusive 9-BANK MEMORY SYSTEM for highest and lowest readings: today's, each of the previous 7 days', and long-term. Say you had a major storm two weeks ago. You can save all the interesting extreme values to show friends weeks later, yet still display all of today's highest and lowest readings, as well as all of yesterday's highs and lows. You'll also see the exact time and date every high and low occurred. You can reset each long-term high and low memory individually, or you can use a MASTER RESET to clear all long term high and low memories simultaneously. This feature makes it particularly easy to keep monthly records or to monitor the highs and lows while you are away for a week or two. The weather station includes BUILT-IN STATIC ELECTRICITY DISCHARGE PROTECTION for all outdoor sensors. 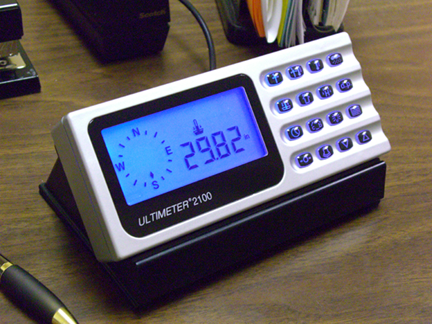 The ULTIMETER 2100 is the most "bullet-proof" full-capability home weather station you can buy. The system also features a unique RAIN RATE ALARM, which serves as an adjustable flash flood alert, and is compatible with all of our rain gauge models. A predictive battery test circuit warns you when the battery is getting weak. The ULTIMETER 2100 has a full array of adjustable ALARMS and an optional electrical EXTERNAL ALARM OUTPUT. Optional sensors include Humidity Sensors and Rain Gauges (we have several models to choose from). The ULTIMETER® 2100 is unsurpassed as the best value in an electronic weather station for the professional or serious amateur weather observer. For more information on how the weather station is configured, please refer to the ULTIMETER 2100 Wiring Diagram. For a comparison of features of all ULTIMETER Weather Stations, please click here. For detailed technical specifications of all ULTIMETER Weather Stations, please click here. To learn about all available optional sensors, please click here. For optional extension cables and mounting solutions, please click Accessories. Includes ULTIMETER 2100 Keyboard/Display Unit, ULTIMETER PRO Anemometer/Wind Vane (w/40' cable), Outdoor Temperature Sensor (w/25' cable), Junction Box (w/8' cable), AC Adapter (w/6' cord), Desk Stand and Wall Mounting Bracket for keyboard/display, and Owner's Manual.